We’d love your help. Let us know what’s wrong with this preview of A Desperate Road to Freedom by Karleen Bradford. To ask other readers questions about A Desperate Road to Freedom, please sign up. What was your least favourite part in the book? My least favourite part was the beginning. It was very boring. Even when they where running from their masters. When she was writing her diary entries they where short and with no date on them. She continuing on like that for until they got to the safe place. They where also short because she was not supposed to know how to read or write. Did the book fulfil your expectation? The book indeed fulfilled my expectation. It was very fun and page-turning! When they got to Canada and found their masters wife and daughter, thought they would have been forced back to Virginia. It fulfilled my expectation a lot. How did the book compare? ‘Orphan at my door’ was very different despite them both taking place in Canada. One was about a home girl and another was a run-away slave. Did the book end the way you wanted? Yes, well mostly. It ended with Julia’s mother giving birth to her sister. She always wanted to be the best big sister like Sarah was to her before she was sold. How would the book have been different if it had taken place in a different place? If this book had taken place in a different time like 35 years before Julia would not have even been allowed in Canada. If anyone knew she was a run-away they would have sent her back to Virginia. My favourite part was when Sarah returned. She ran with her husband and daughter it was so sweet I just about died!! I will rate the book a 3. I will rate it a three because it was not very descriptive. She did not really talk about the characters. It was also boring at some parts. It was about a run-away slave named Julia. Julia’s sister, Sarah and her bothers Caleb and Daniel where sold to other slave owners. At the end of the book, Sarah is reunited with her family. The book is mainly about them getting to Canada and trying to stay safe!! I did enjoy the book very much. It was full of page-turning excitement! The one main thing I learnt was that there is always room for mistakes in friendship but there is always room for forgiveness. When Julia’s white friend is racist she has room for forgiveness in her heart! I did not have to force myself to read it at all. It was one of the best books I've ever read. I can easily say that it was better than twilight. The plot sucked me in and just when I thought it would be boring it just got better!! It is a must read! They were very realistic. It was also very detailed in the actions of the characters. Like how Thomas wanted revenge on the slave masters so he went to war against them. Lots of coloured men did that. The author obviously based it on historical facts. Witch characters would you like to meet? I would like to meet Sarah and ask her about how she felt when she was taken from her family. I would also ask her how she found out that her family would be in Toronto. I would like to also meet Thomas to get more information on why he went to war and how he got wounded! Did the actions seem plausible? Eleven-year-old Julia May is more fortunate than most slaves in the southern states during the Civil War. As a young girl, her owner assigned her to be the personal slave and companion of his young daughter, Miss Marissa, and so Julia May didn‘t have to endure working in the fields of the plantation. Julia May learned to read and write while listening to Marissa’s lessons. Marissa didn’t care that her slave was educated, and kept Julia May's secret so that Julia May could help her with her schoo Eleven-year-old Julia May is more fortunate than most slaves in the southern states during the Civil War. As a young girl, her owner assigned her to be the personal slave and companion of his young daughter, Miss Marissa, and so Julia May didn‘t have to endure working in the fields of the plantation. Julia May learned to read and write while listening to Marissa’s lessons. Marissa didn’t care that her slave was educated, and kept Julia May's secret so that Julia May could help her with her schoolwork, and even gave her scraps of paper to practice writing on. Julia May uses these precious pieces of paper to start a diary of her life. In January 1863, after learning Julia May’s older brother, Thomas, might be sold to another plantation, Julia May’s parents decide the family will escape to freedom. Three of Julia May’s older siblings were already sold, and her mother can’t bear to lose another one of her children. In the dead of winter the family makes a dangerous escape, and takes refuge at a Union Army fort. However, to ensure their freedom no matter what the outcome of the war is, her parents decide they will continue north to Canada, where slavery has been completely outlawed and runaway slaves cannot be returned to their owners. Julia May writes in her diary about her family’s dangerous journey north as well as the first year of their new, free life in Canada as she makes new friends, goes to school for the first time in her life, and worries about her brother Thomas, who has gone back to fight in the war. Slaves are seen as objects that are used and owned by the white, but why does it have to be that way? We live being scared everyday and the un aware of were our brothers and sisters were sold too. With the heavy labor upon our backs. Being not aloud to read or write, learn, go to school, or be independent and have our own lives. That’s why we are running, but scared we will be caught. Panicking and shivers run up my spine, where will we land next? The book is very realistic, and keeps you wanting to read more. When I’m reading this book I feel like I am watching a movie because of how descriptive the writing is. The author makes it so realistic by how the layout of the sentences are put. I personally think that the book gets boring where they are in the wagon, because nothing interesting happens at this time. Since the family runs for a while it gets confusing on what is happening, for example, when they end up staying with the longs. Sometimes I need to read back to figure that out who is who because the story introduces so many characters. I like how the book is put into a diary format. I enjoy this story, because it is very interesting to read how our history was like. The story has lots of emotion and paints a picture in your head of how it was back then. I cannot relate to this story because I have never experienced it before. But I can tell it must of been very hard for her and her family to have had to experience such trauma. This story connects with present day because unfortunately we still deal with color stereotypes and racism. In my opinion, the book can be a bit bias at times, by the way it is written shows that the majority of white people are racist. But I do understand that it is in her point of view. People who like true events or learning about black history might enjoy this book. That is why I find this book very interesting. Julia May Jackson was born a slave in Virginia just before the American Civil War. She is slave to the masters daughter and unbeknownst to anyone, has learned to read and write. Three older siblings have been sold, and there are rumors that her older brother, Thomas, will soon be next. Late one dark night her parents wake her, tell her to grab her things and keep quiet. It is the beginning of the family’s journey along the Underground Railroad to freedom in Canada. 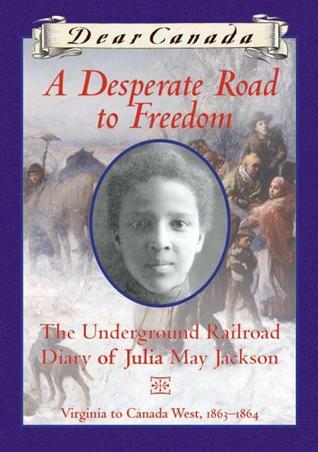 Julia May keeps a journal of t Julia May Jackson was born a slave in Virginia just before the American Civil War. She is slave to the masters daughter and unbeknownst to anyone, has learned to read and write. Three older siblings have been sold, and there are rumors that her older brother, Thomas, will soon be next. Late one dark night her parents wake her, tell her to grab her things and keep quiet. It is the beginning of the family’s journey along the Underground Railroad to freedom in Canada. Julia May keeps a journal of their experiences – a journal that could cause serious repercussions should it fall into the wrong hands. This book had a strong beginning that grabbed my attention and pulled me into the story. Julia May is a spunky spirited girl who I liked a lot. I desperately wanted her family’s journey to be successful. They make it to Toronto, but while free, are still in danger of being kidnapped by slave hunters. Eventually they move to Owen Sound where they put down roots. I really liked how this book portrayed history in an exciting format. I knew something about the underground railway of course, but this book helps us to understand more about what it was like once these people made it to Canada. They may have been ‘free,’ but they still faced considerable prejudice once they arrived. This is a great addition to the Dear Canada series! Nice book, with a few lovely moments. I do like slice of life/survival stories. No other book in the Dear America/Canada series so far has managed to capture the sheer Emotional Impact of A Picture of Freedom: The Diary of Clotee, a Slave Girl, Belmont Plantation, Virginia 1859, though. So everything is rated realtive to that. Karleen Bradford gives us a wonderful story that's half adventure story and half settler's narrative. The characters are all interesting and complex in their own ways, and she deals with era-appropriate racism in an age-appropriate way. A great entry into the Dear Canada series. I really enjoyed reading this book and since the first time that I had read it, my overall opinion of the story has changed. I loved reading about all of the changes that occurred in Julia May's life as it had kept myself engaged throughout the story. I definitely recommend this book to anyone who enjoys reading about history, as well as the history of Canada. This seems like it will be a good series. It's written for young readers, maybe 3rd or 4th graders, and will give students a better understanding of history since the books are written from a young person's perspective. 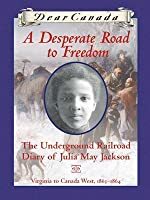 Another book from the Dear Canada series, A Desperate Road to Freedom focusses on the Underground Railroad that helped save many lives. 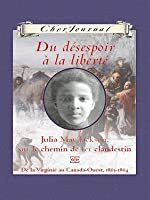 This book follows the story of Julia May Jackson and her family as they escaped from their past lives as slaves to the new world, Canada. Not bad. A light read and a good one to introduce younger generations to the Underground Railroad and Slavery. Wonderful story, my only regret is that it took me so long to read it! Not bad. Not as much focus on the Underground Railroad as the title would have you believe, however. They were off that part by p. 46. I was expecting more emphasis on that. Really depressing but really interesting. Enjoyed this book, lots of history!